From my in house Guestbook. What I enjoy most about hosting is the variety of people I meet and the interactions I have with them. I am grateful for the wonderful guests I accommodate and I like to think that the experience means as much to them as it does to me. I love where I live and what I do. Since my ex-partner and I first bought Motuaruhe, over 20 years ago, sharing it with others was all I ever wanted to do. When I look at world-wide social sites where hosts chat online about their fears, doubts and frustrations I am always quietly relieved that my own experiences with guests have been nothing less than fantastic. I am sorry that some other hosts have difficulties and I am supremely grateful for my blessings. Two days ago I waved goodbye to a couple from Dunedin, NZ who, before they left, presented me with a box of bespoke chocolates. I was tickled pink…. and that’s not all! The previous evening they had invited me to join them for a glass of bubbles to celebrate a BIG birthday. It was really pleasant, sitting out on the deck at ARUHE, sipping French bubbles and nibbling on Comte cheese. Delicious! This isn’t the first time either of these things have happened. I have been presented with a bottle of Pinot Noir by a lovely Rotorua couple who also invited me to join them for dinner. Fresh fish caught just that morning and Tasha’s homemade Pizza hot from the BBQ. I was really impressed with the pizza, not being much of a BBQ cook! Several other times I have been invited to join guests for dinner or for drinks and I always find myself (privately) grinning with the sheer pleasure of their generosity and my good fortune. It’s not all been one-way. I have invited many guests for a glass of wine and sometimes they join me for dinner. UK visitors from my first season, occasionally drop me an email with photos of where they live and where they have been. Another couple shared movies with me and sent me a recipe for Kasundi. I am very appreciative of the technical advice and assistance I have been given. I so enjoy hearing about other peoples’ lives, their history, their aspirations, the things that make them happy. Everyone has a story to tell. Of course I have some stories as well. The double booking and the distress that caused was not a proud moment. The embarrassment I felt when a guest sat on the bed and it promptly collapsed. Fortunately this turned out to be a design fault and nothing I could have predicted. Fixing the bed for the following night when I was expecting a honeymoon couple (yes, truly!) had me a little worried but after ringing a couple of local guys they came up and, with lots of good cheer, fixed the bed for me. Phew…saved! And I have had fantastic reviews. 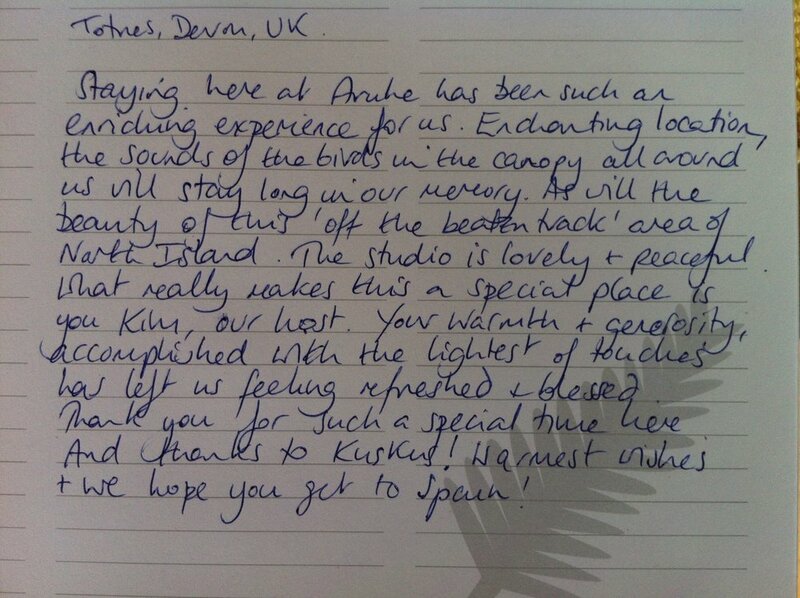 You can see some of them here from my Guestbook. Reviews on Airbnb where I am a Superhost, Trip Advisor, BookIt, and other NZ sites where I have a listing are all pleasing. One of the difficulties of living in the wopwops is that tradespeople are a long way away and of course getting them out to Whanarua Bay costs an arm and a leg. Kiwi ingenuity plays a big part around here and fortunately I have great neighbours. A couple had to come and shower at my place because there was no hot water, and despite my offer to refund a night’s stay, and their refusal, they took it all in their stride and still gave me a great review. Another couple ran out of water and I had to ask Ross, who also runs a B& B and fortunately did not have guests at the time, to pop up and help me remedy the situation. That day, I learned something new about the water delivery to ARUHE. What makes these events into stories, rather than something I might be ashamed of, was the good grace with which my guests endured these difficulties. And when things go wrong then vouchers are sent. I have no hesitation in doing this as it’s really important that guests have a great experience. Whanarua Bay is far from “cool” shops that guests might feel tempted by. There are few organized adventure activities and consequently there’s no pressure to “do anything”. The scenery is amazing and guests can drive to East Cape and be among the two or three first individuals in the world to see the sun rise on their chosen day. There’s a café at Pacific Macadamias just five minutes down the road and there is the Bay for swimming, snorkeling or wandering. There are some other idle pursuits like walking through the bush to the waterfall but none of these activities demands much. ARUHE is the perfect place for a honeymoon, a babymoon (a new one on me, but what a perfectly good idea), an anniversary or a place to recharge the batteries, listen to the birds, gaze at a pollution-free night sky and just relax. Now, breathe out…….. aahhhh. There are so many little stories I could recount and ARUHE has only been taking guests for two Summers. If the next two, four or six are as much fun and my lucky stars are still twinkling (and why would they not? ), then I will still be grinning like a cat who found the cream.